This chapter introduces a case study focused on the problem of groundwater depletion resulting from the use of modern irrigated agriculture in an arid region that relies on groundwater, along with initiatives that have been made to address the problem. It became apparent, as a result of interaction with a diverse range of stakeholders, that local environmental knowledge possessed by pickling melon farmers and rain fed wheat farmers – groups of people that could be described as the socially vulnerable in the region studied in this chapter – has the potential to open up new markets as well as reduce the pressures on consumption of groundwater resources. 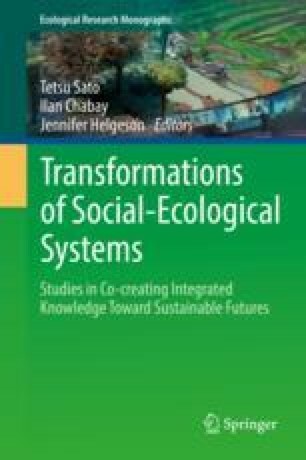 The authors discovered that this local environmental knowledge connected with agriculture that is founded on the traditions and cultures of the socially vulnerable could help solve a series of regional issues caused by large scale modern irrigated agriculture which is run by farmers described as the socially privileged. As described in this chapter, the authors utilized a transdisciplinary approach in cooperation with a diverse range of stakeholders to visualize the problems at hand and to uncover and catalog local environmental knowledge, the content of which forms a story for solving local issues and creating a new history.